I have a recalcitrant basset fighting my Macbook so he can sit on my lap. For now, the laptop computer has possession of the lap, but a basset snout can be a forceful instrument so you can be sure that this pushy basset will eventually get his own way. Bassets do not make the best perch for a laptop nor ideal workstation ergonomics, but where laps and bassets are concerned there is no contest. It’s been a hectic time recently travelling for work, trying to stay one step ahead of the spring growth in the garden and some weekend entertaining with friends. Studying can be all consuming making regular blogging hard to maintain, but the end is in sight for this year’s modules even if there are 5,000 words between me and the finishing post. On days when I am at home, the high point is always when I take the hounds out for their daily perambulation. This is the time when I give my brain a rest and leave the chores on the list for an hour. 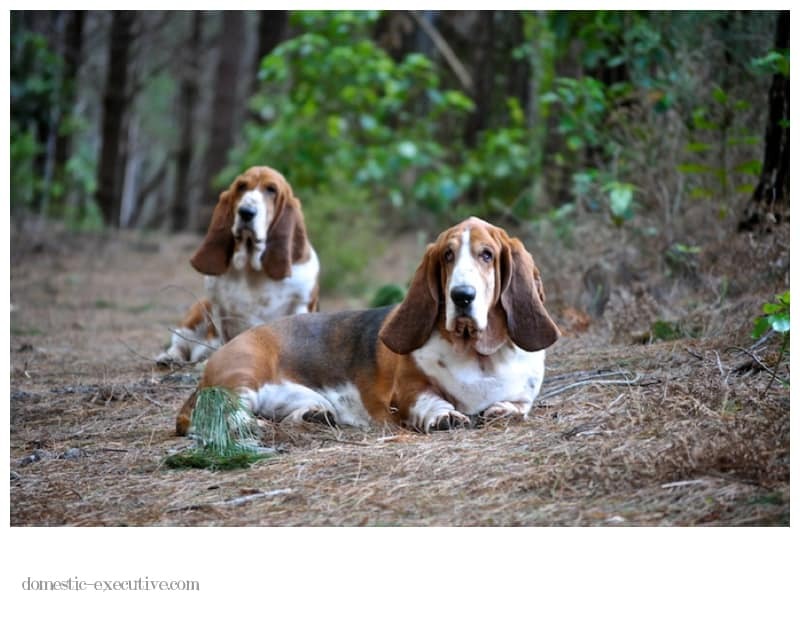 Admittedly gale force winds and rain of biblical proportions has interrupted normally walks as bassets develop powerful suction on their paws that anchor them to the sofa watching the rain pound the ground and trees bowing over in the wind. I can’t blame their reluctance to do battle with the weather as Wellington’s famed horizontal rain is no fun at all, and if you have the equivalent of a set of powerful sails attached to the side of your head you would want to keep those flappy ears safe from driving wind and rain. Last summer we found a new forest walk close by and on fine days it is a remarkable place to walk. 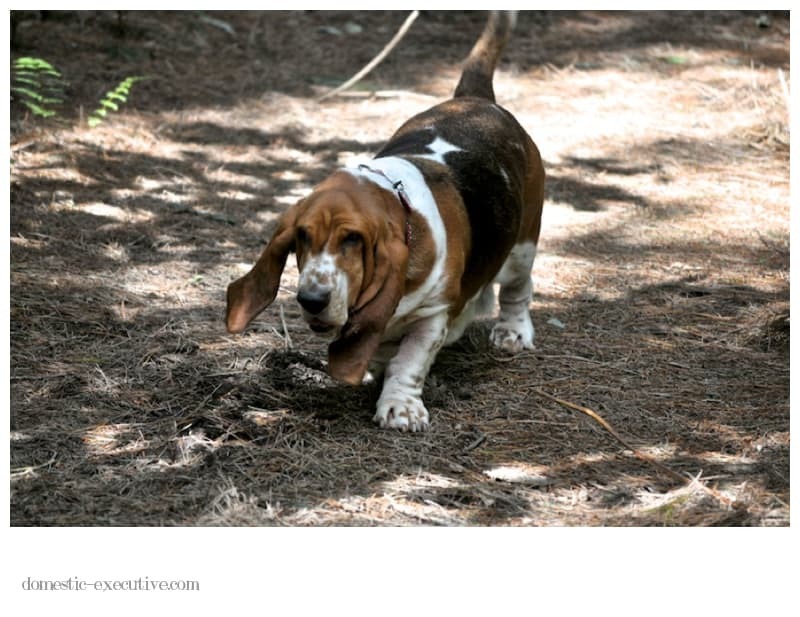 The pathways are filled with pine needles, a perfect soft carpet for big basset paws and largely sheltered from any wind. On a fine day, the sun shines through the forest canopy dripping light in an almost magical way. It’s the place where you can fill your lungs with fresh air and open your mind so the cluttered thoughts of work, study and chores blow away. 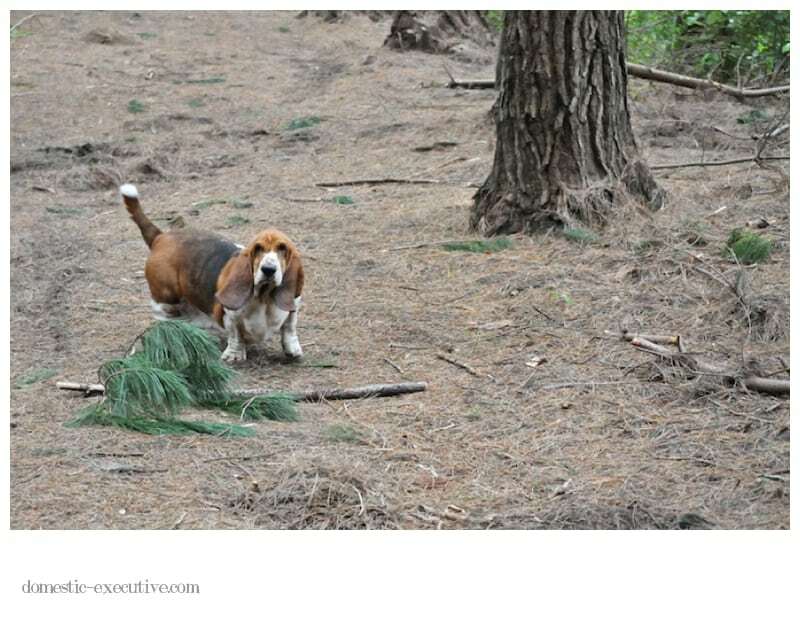 As the bassets undulate amongst the trees, it’s a non-stop game of chase with Fortnum breaking the silence with his deep seal like bark. Occasionally though the hounds are happy to oblige for a posed photograph before they shoot off again weaving their way down the path. Seeing the hounds scuttle along like rabbits makes me want to kick up my heels and follow suit. And if no-one is around I might just do that. 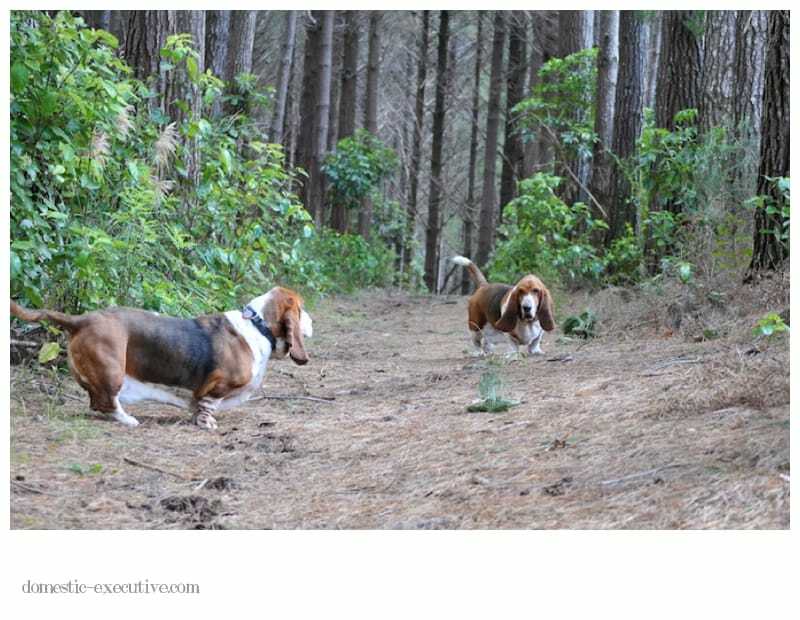 Another marked difference between bassets and labs — labs love rain, the more horizontal the better! I just get rugged up and waterproofed, and go out to enjoy Lucy’s utter thrill at speeding through wet grass and splattering mud. When it comes to pine needles, she’s not content to pad lightly. 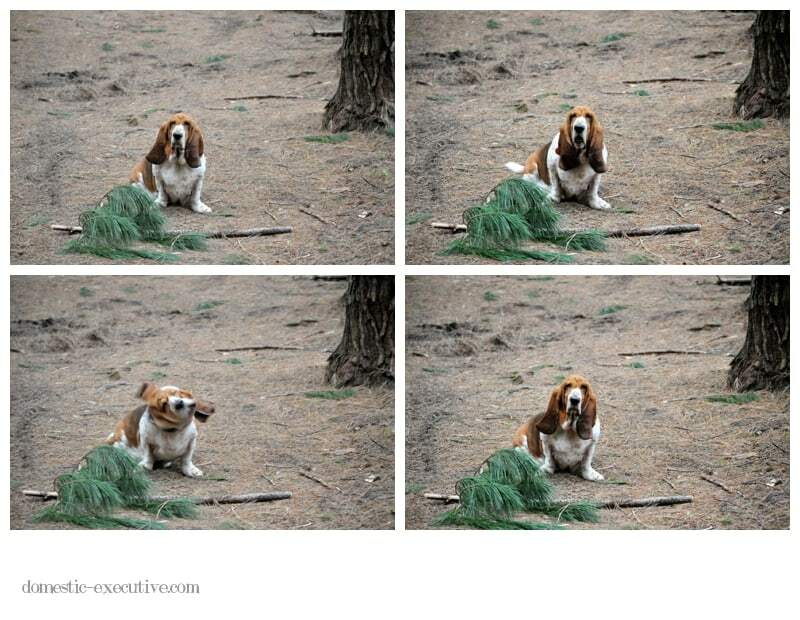 Pine needles are her favourite full body exfoliation treatment.